The world of high-speed dispersion can be very overwhelming and confusing and the only way to learn about it is via industry experience. Between different manufacturers, models, accessories and options, it’s hard to know where to begin. High speed dispersers are used in many different industries including paints/coatings, inks, adhesives, plastics, pharmaceuticals, personal care/cosmetics, food, etc. Dispersers used in a laboratory setting are smaller and designed for research and development where accessories can be switched out quickly and easily. They need to be versatile to accommodate a wide range of testing applications and batch sizes. Dissolvers for the lab and pilot plant include ones up to 7.5 kW along with explosion-proof and under vacuum. Special dispersers are designed for high viscous and non-flowing material with a scraper system accessory available to ensure all ingredients are thoroughly distributed and mixed evenly. A variety of bead and basket mills are used for materials needing superb grinding along with homogenizers for use in liquid applications such as emulsions and suspensions. A specialty instrument is used just for testing coil coatings by subjecting them to an extremely high level of shear. This mimics the high stress during the coating process of steel/aluminum strips and then the coating can be evaluated on test panels. One way to achieve the needed versatility is by using a modular system which allows the dissolver to be easily changed into a bead or basket mill, vacuum dissolver, homogenizer and to accommodate high viscosity products. These modular systems are easily adapted to the disperser via the dissolver shaft or adapter flange. These accessories make lab production and experimentation more economical because it eliminates the need for several dispersers to accommodate different batch sizes and applications. 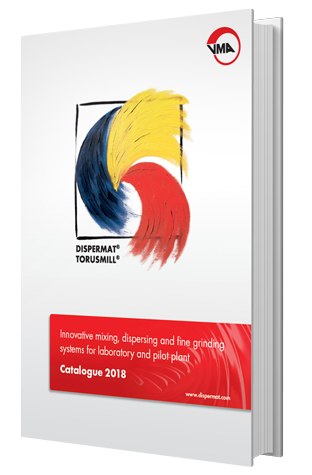 Bead mills, vacuum systems, basket mills and modular scraping systems are available for select DISPERMAT® dissolver models. Bead Mill: with a modular milling system, the disperser is converted to a closed batch vertical bead mill. Available in vacuum, pressure, ceramic and nano versions and can accommodate batch volumes ranging from 8-3,500 ml. Basket Mill: the addition of a modular basket system converts a disperser into a closed basket milling system. A basket is lowered into the millbase making it an extremely efficient grinding system and is available for vacuum operation and in ceramic and nano versions to process batches ranging from 0.25-50 L.
Vacuum System: useful when dispersion process must be carried out in a closed system under vacuum. An optional scraper system is also available for highly viscous substances. For batch sizes of 0.2-5 L (with glass cover for easy observation) and 8-25 L with aluminum cover. Homogenizer: a modular rotor-stator system is available for use with very low viscosity solutions. Rotation of product is prevented, and energy is concentrated in a very specific area. Ideal for use with suspensions, emulsions, dissolving and chemical reactions in industries such as food & beverage, pharmaceuticals, biotech, chemicals and cosmetics. For product batches of 0.1-10 L.
Scraper System: essential accessory for highly viscous and non-flowing products to ensure all material is mixed and dispersed thoroughly. Available for batch sizes of 0.35-3.5 L.
When scaling up dispersion from lab/pilot plant to production, the key factor is mechanical power because that limits how much of a dispersion can be achieved. A successful dispersion is dependent on how quickly agglomerates make it to the most effective shear zone which is dependent on the mechanical power applied to the millbase. The rate at which particles are carried into the area around the dissolver disc determines how much time is needed to achieve optimum dispersion. The most effective shearing is at the tip of the dissolver disc so the tip speed (or peripheral velocity) is the key parameter when scaling up to production size equipment. Production units are larger; therefore, it will take more time for the agglomerates to reach the dissolver disc tip and the time to reach optimum dispersion will also be longer than when using a smaller, lab disperser. Another factor is whether the temperature conditions are similar or not. Use of a double-walled temperature-controlled mixing vessel is the recommended to guard against temperature variations. Dispersers used in production can handle batches from 25 – 2,000 L with mechanical power input from 15-55 kW.